International cricket is undoubtedly the highest form of cricket. Growing up, every cricketer dreams to play international cricket for his/her national team. Wearing the country’s cap is a matter of pride for any individual. In India, cricket is treated as a religion and a lot of kids dream about donning the India jersey. However, not everyone gets to live their dreams. Kerala is not a very famous place on the world map, especially in the cricket world. However, it has produced a few cricketers who have gone on to play for India. You might be aware of one, or at the maximum two, but here are three cricketers that have donned the India colours in some format. This name might come as a surprise. Sanju Samson is one of the household names for a couple of months every year. 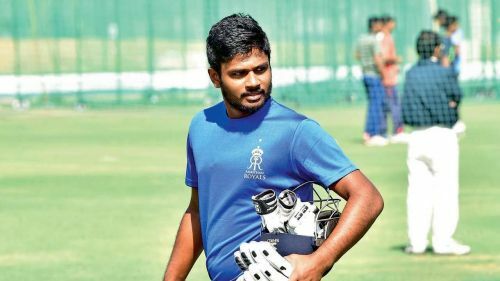 Every Indian summer, during the Indian Premier League (IPL), Samson has been one of the key Indian players for whichever side he has played for so far. He has played one international game for India which came in a T20I in 2015. The right-handed wicket-keeper batsman played the second T20I against Zimbabwe during India’s tour in 2015. He made a sluggish 24-ball 19 and has never got an opportunity again. The Trivandrum-born wicket-keeper has been an IPL regular though. He made his IPL debut back in 2013 and has played 81 IPL games so far. However, despite being a regular in the IPL and given the talent he possesses, it is a little surprising that he has played just one international game. He has been playing continuous cricket and has been around the fringes of the Indian team in recent times. He recently played for India ‘A’ in the A Team Quadrangular Series which involved Australia ‘A’, South Africa ‘A’ and India ‘B’. He didn’t have great results as he scored 94 runs in 4 innings. Hence, he will be looking to make the most of the upcoming Ranji season and try to break the door of the Indian cricket team.